Hijacking the brain’s blood supply, tumour discovery could aid treatment. Dangerous brain tumours hijack the brain’s existing blood supply throughout their progression, by growing only within narrow potential spaces between and along the brain’s thousands of small blood vessels, new research shows for the first time. The findings contradict the concept that brain tumours need to grow their own blood vessels to keep themselves growing, and help explain why drugs that aim to stop growth of the new blood vessels have failed in clinical trials to extend the lives of patients with the worst brain tumours. In fact, trying to block the growth of new blood vessels in the brain actually spurs malignant tumours called gliomas to grow faster and further, the research shows. The discoveries come from a University of Michigan Medical School team studying tumours in rodents and humans, and advanced computer models, in collaboration with colleagues from Arizona State University. Published in the journal Neoplasia, the research suggests a new avenue for finding better drugs. The vessels that the researchers studied feed the brain’s constant need for energy and communication with the rest of the body. They have a special vessel wall structure that protects the brain from infection or other blood-borne dangers. The new findings show that tumour cells grow exclusively within the spaces around the vessels, close enough to draw their own energy and fuel their growth in the same way normal brain tissue does. Instead of spawning their own offshoots of these vessels as the tumour cells divide, they simply crowd out the normal cells in the immediate area and continue to fill the spaces between neighbouring vessels. This continued autovascular growth, as the researchers call it, was detected from the very beginning to the final stages of tumour progression. 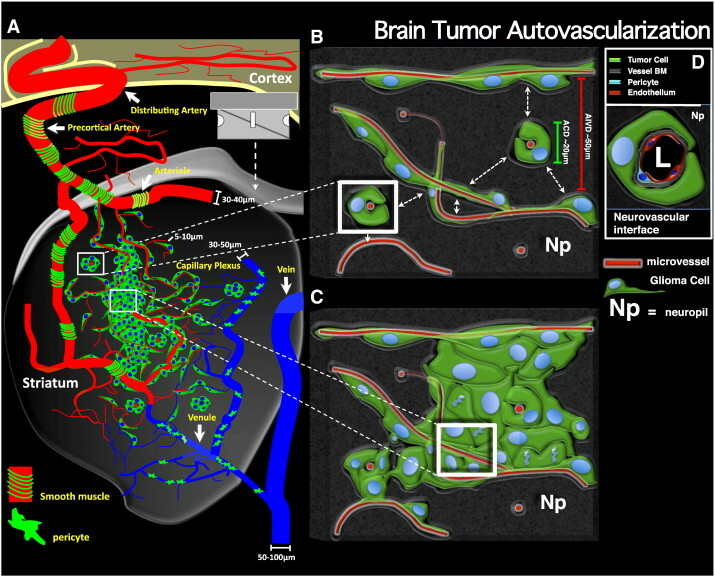 It runs directly counter to the theory of neoangiogenesis, or new blood vessel formation, that has driven the use of certain drugs to treat brain tumours such as glioblastoma multiforme and other cancers. Last year, two clinical trials showed that glioblastoma patients taking an anti-angiogenic drug as part of treatment didn’t survive any longer, and in some cases suffered more side effects than patients who didn’t get the drug. Patients whose glioblastoma has returned after treatment also use the drug to reduce swelling. The researchers caution that it’s far too soon for patients to make medical decisions based on their findings. But they note that further research on how new therapies will directly affect the tumour cells growing along blood vessels is already under way. The key question has been to determine how tumour-generating cells grow to form the macroscopic tumour mass that eventually kills the patients. The team have shown that because of the very high density of endogenous vessels in the brain and central nervous system, the cells grow along those pre-existing vessels and eventually divide to fill the space between them, where the distance between any two vessels is very small. This iterative growth along vessels and into the space between means the tumour does not grow like a balloon requiring new vessels to grow into its expanding mass to rescue it, but rather as an accumulation of local small masses which then coalesce into a large tumour. The team notes that the angiogenesis theory of all tumour growth proposes that tumours more than one cubic millimeter in size need to attract their own blood vessels to survive. The theory emerged after research on non-vascularized tissue. But in the brain, a very large density of blood vessels already exists within that volume of brain tissue. And few tumour cells are sufficient to fill the space in between any two vessels. The researchers confirmed this by examining tissue from mice and humans through special microscopes – and modeling their growth predictions with powerful computers. They also saw that tumours caused the cells of the blood vessels’ walls to spread apart, allowing fluid to leak out. This leakiness results in the edema, or fluid-based swelling, often associated with brain tumours. In the new study, the research team did show that, as expected, the anti-angiogenesis drug bevacizumab did stabilize the walls of the tiny vessels, reducing edema. This echoes the experience of human patients who use the drug for recurrent gliobastoma, many experience a reduction in cognitive symptoms and increased quality of life as less fluid builds up in their brains. But almost perversely, the same drug designed to stop tumours may actually make it easier for them to grow. In the newly published research, mice with brain tumours treated with the drug died at the same time as mice that didn’t receive the drug for their tumours. By tightening up the leaky vessel walls, the drug may make it easier for tumour cells to continue the autovascularization process, the researchers suggest. The team state that it’s as if the tumour’s growth along the road of a blood vessel had resulted in many potholes to form on the road’s surface. But when the anti-angiogenesis drug is given, essentially patching the potholes, the tumour cells get a smoother road to grow along. It may even give them a highway across the divide between the brain’s halves. Armed with this new understanding, the research team has shifted its focus to finding ways to attack tumours from within the vessels they grow along. The team are now looking for ways to deliver molecular nano-sized drugs intravenously in the immediate area of the tumour. They’re also studying in more detail how the tumour cell growth changes the structure of blood vessel walls and the surrounding tissue. I hope more advance studies will come out and a cure will be found in the study.